The increase in the number of devices in the world is producing new challenges relating to connectivity. Users are carrying more connected devices about their person than ever before, and with there being more network-connected hardware in homes and businesses, including smart home devices and those classified as part of the Internet of Things, the sheer quantity of potential connections could make things hard for devices to discover each other, or even to connect at all. As part of a solution to this, Apple has filed three patent applications with the US Patent and Trademark Office suggesting slightly different ways to establish and operate a connection between pieces of hardware. 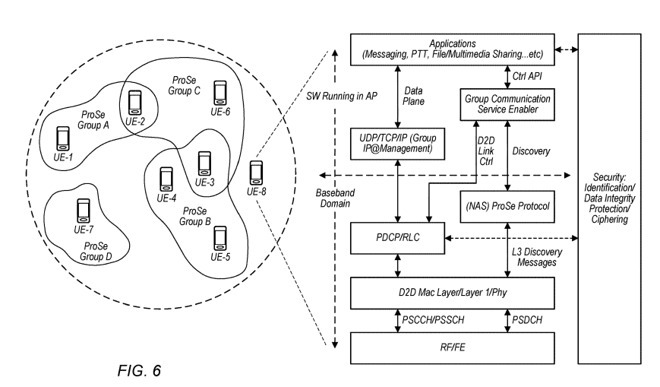 The first patent application, "Control and Shared Channels in Device-to-Device Communication," handles how narrowband connections between devices can be handled. In short, it suggests a device can go through device-to-device (D2D) discovery once it has synchronized as part of a group, then establish initial resources for control with a second device it needs to communicate with. The first device transmits control information to the second, as well as indicating a buffer status, and awaits a signal from the second control to acknowledge the indication and to start a transmission. To make the connection more robust, it is advised the first attempt at establishing communications uses a "multi-tone transmission configuration," before switching down to a "single-tone" version if that fails. The first patent application's illustration of an "exemplary cellular network supported device-to-device communication architecture"
The control information could include various bits of data, including a frequency hopping pattern, transmit power, and the transport format. Periodically, the resources can also expire in terms of availability between the two devices, with the system re-initiating D2D discovery in those cases. The second patent application, "Synchronization Sequence Design for Device-to-Device Communication" handles the same narrowband communications subject, but instead deals with synchronization sequences. On establishing a connection with another device, the first sends a preamble of an initial synchronization sequence, which includes a number of repetitions of "orthogonal frequency division multiplexing" (OFDM) symbols. Namely this is a system where data is split into multiple sub-signals and sent simultaneously, speeding up overall transmission times. It is suggested the synchronized sequences can be transmitted with a gap between each individual sequence, sent cascaded, or via a number of different sequence methods, such as a "Zadoff-Chu" sequence. The third, "Off Grid Radio Service System Design" is actually quite similar to the second, dealing with the use of synchronization signal repetitions for a transmission. This synchronization signal can be generated a few ways, with root index values based on the number of repetitions or a value for a Zadoff-Chu sequence. A secondary synchronization signal is then able to be generated, with the value again able to stem from a Zadoff-Chu sequence, or even the device identifier for the transmitter, with the synchronization signal able to include details of a physical broadcast channel with frame number and subframe number. Again, characteristics of a transmission based on repetitious synchronization signals can be used by the receiving device for establishing the connection, including the signal strength and quality, and the number of repetitions. The D2D synchronization preamble could also be set to be transmitted at a time and frequency maintained by a local clock on a device, which would most likely be synchronized with the clocks of other devices or under universal time (UTC.) Knowledge of the timing would help with being able to monitor for transmissions especially when attempting to re-establish an expired or failed connection. While the time clock drift between devices communicated with each other, it is suggested that the devices could be synchronized by using the time received by a GPS system, which one device can potentially receive, correct itself, then synchronize with others in the area. 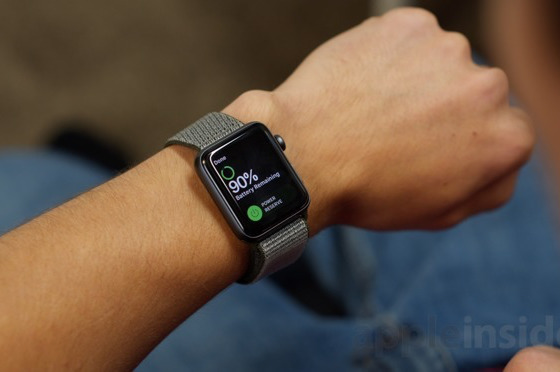 Though the patent applications largely deal with wireless communications that do not necessarily involve human interaction, like an Apple Watch maintaining a connection to an iPhone for example, it may also work in other ways. One extreme example could be a natural disaster that knocks out or overloads cellular networks in an area. By being able to establish connections between mobile phones without relying on the cellular network, this could allow there to be a mesh-style network running between all of the devices, allowing some level of communications through. Apple files numerous patent applications with the USPTO on a weekly basis, but it isn't a guarantee the technology brought up in the filings will make its way into future products or services. The filings do however reveal areas of interest for the company.